Chop both greens coarsely. Peel stems and chop those too. Wash, drain, place in container of pressure cooker with chillies. Place channa dal and peanuts in another container of the cooker. Add 1/2 cup water to each container. Pressurecook for 4 whistles. Cool, remove and blend the boiled greens in a mixie or with hand beater. Add gramflour to 1/2 cup water, make a smooth paste keep aside. Heat oil, add cumin seeds, bayleaf, cardamoms, curry leaves and clove-cinnamon powder. Stir a minute and add boiled peanut and dal whole, with the water. Bring to a boil, add blended greens, masalas, salt, sugar, lemon. Add remaining water, stir well. Bring to a boil. Add gramflour paste. Stir continuously till boil resumes. Lower and simmer for 5-7 minutes. The consistency should be like that of kadhi (refer khichidis). 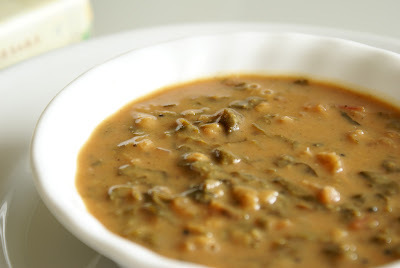 Serve hot with masala bhath or bhakri. Serving Suggestion: Serve with chapathis. Note: This recipe looses its taste if heated again and again.